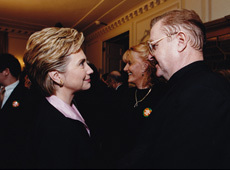 Sean Mc Manus & Hillary Clinton in 2009. IT’S difficult to know whether the DUP would have reconsidered supporting Brexit if the party had been aware of the catalytic effect that severing ties with Brussels has had on the desire for a united Ireland. Even when it’s obvious that its strategy is unpopular and akin to self-harm, the DUP doggedly persists, its vision impaired by the red, white and blue filter through which the party views the world. 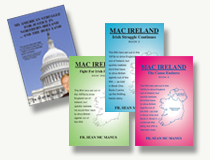 Prior to the 2016 EU referendum, the quest for Irish unity was little more than an aspiration. Even with favorable demographics, the prospects for securing a border poll, never mind a successful outcome for nationalists, were remote. But when 56 per cent of people in the north saw their hope to remain in the EU dashed by what many regard as a surge of English nationalism, a united Ireland was back on the agenda. It’s to be expected that Sinn Féin will agitate for a border poll but when senior British politicians start raising it as a very real prospect – the BBC yesterday reported that three ministers have said a no-deal Brexit could lead to a vote on unification – it’s time to take notice. Arguably, there’s merit in this cynical assessment. Ministers talking of a potential unity referendum could be interpreted as a ploy to pressurise the DUP into accepting a compromise on the backstop and ensuring the withdrawal agreement has an easier passage through Westminster. The DUP leader is right insofar as the criteria have not been satisfied at present but then we’re all still hoping for a last minute deal that will prevent the UK crashing out of the EU on March 29. But what Mrs Foster and her party appear oblivious to is that a disorderly Brexit would be most unwelcome in the north, to say the least, and a majority of people would likely blame the DUP’s stubbornness for the ensuing chaos that would inevitably ensue. Business organizations and the farming lobby have stressed how damaging a no-deal would be and it’s unlikely that if such a scenario comes to pass they would suddenly reconcile their differences with the largest unionist party. While that in itself doesn’t necessarily spell increased support for a united Ireland, it would certainly raise questions about the motives and competence of those who claim to have Northern Ireland’s best interests at heart. Couple those sentiments with growing disillusionment at the trajectory on which English Brexiteers are intent on taking the UK and middle ground opinion in the north could easily shift in favor of a united Ireland. Whether this latest claim about a border is a British government scare tactic or not, a botched Brexit is something the DUP should fear.